Manufactured By – Sony Music Labels Inc.
Japan exclusive SACD hybrid multi-ch edition (4ch mix). It uses two-layered SACD with DSD 11.2MHz mastering made in 2017. 7-inch size mini LP (22-panel) faithfully replicates its original LP designed by Tadanori Yokoo. Including original color photos, liner notes, and the original OBI. Also includes reproductions of a Japan tour pamphlet and an Osaka concert ticket. Foreword in booklet by Carlos Santana. Recorded live at Kosei Nenkin Hall, Osaka, Japan on Jul. 3 & 4, 1973. 1-8 is a vocal version of Pharoah Sanders' "Japan" from Karma. I was unaware about Lotus before, until when it caught my eyes when in CD-Japan shopping. I did not play this for a month, because i was not sure what to expect. But finally played this last week and was shocked at the level of engagement I had in completing all 3 SA-CD in one go. This is so nice, thanks to the wonderful mastering done. I read a few reviews complaining about the lack of sound from rears, but its presence is felt as if you are standing close to the stage and surrounded by the ambiance which will be there in any live performance. 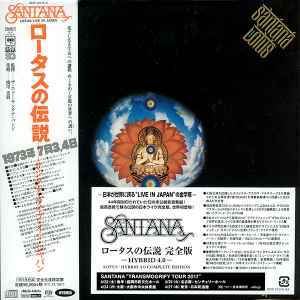 I am not commenting about the music, which is outstanding, Santana pushes listener into Trance.